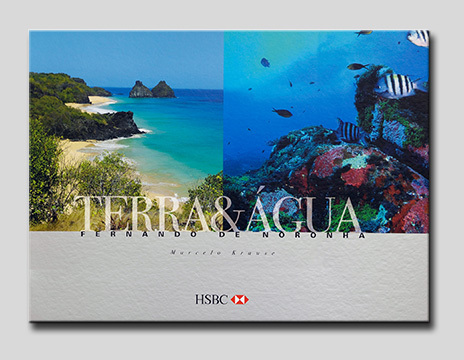 Fernando de Noronha Terra e Água is a photo art book portraying not only the island beautiful scenery and beaches, but also its amazing underwater world. The underwater photos cover many of the famous dive points such as Pedras Secas and the 200ft dive at the wreck of Corveta Ipiranga, a sunken Brazilian navy war vessel. A vast range of sea creatures such as turtles, dolphins, stingrays, groupers and sharks made their way into the book. The book also convers the island most famous landscapes such as Morro Dois Irmãos and the wonderful Sancho Beach. There are many photos away from the beaten path, lesser know landscapes such as Pedra do Abreu e Capin-açu cave. An essential book for all people that loves and admire the island of Fernando de Noronha.